As a preface I will note that I was in high school in 1996 when our laws came down, and at that time owned no guns for anyone to pry from my cold, dead hands. 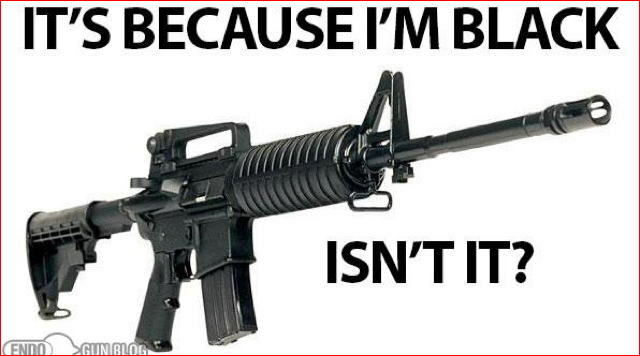 The common conception of how an assault weapon ban will pan out in America usually follows the same inscrutable logic. The Feds will ban the weapons and the citizens will revolt. Truth, Justice and the American way will be restored. The end. I would offer an alternative. It's less patriotic, there's no swelling crescendo of "from sea to shining sea", and there's no happy ending. Thus it's completely impossible. I offer it none-the-less. After some run of the mill atrocity "that happens nowhere in the world but the USA" the Feds manage to pass a law banning "assault rifles". There is a generous buyback included, paid for by the federal money spigot. They know only a few guns will be handed in initially so it's more than affordable. A thousand legal battles will be launched but they will take time to come to fruition and the government is not bound to wait until the result comes out in the wash. Meanwhile there will be a groundswell of protest. People will march in the streets with their ARs and AKs. No matter. The buy-back amnesty runs for six months. Nobody is breaking the law. Meanwhile other more important factors are coming into play. Immediately noticeable is the disappearance of online trading in the banned articles. The guns themselves. Magazines for said guns. Etc. Companies like Cheaper Than Dirt can be easily bankrupted by court orders to cease and desist trade. They will not martyr themselves. Gun ranges, also typically being business entities, will no sooner allow you to arrive with banned assault weapons than they would allow you to bring in a pound of cocaine. "Just give the courts some time work it out, Joe", they'll say. Some ranges will shrug off the rules. Nothing will come of it. Not until later. Similarly, larger companies that manufacture such guns are now either forced to go back to building bolt action rifles or go to work for the government. Back room deals will be made. Nobody will be out so much as a dollar. "Just go along quietly. After all. If the American people want freedom then it doesn't fall to Remington to drag them to it kicking and screaming." The months will tick by. The protests will start to dwindle in number and attendance. The amnesty is still in effect and many are starting to wonder how this thing is going to go down. After all. Nobody has started shooting so far, at least as far as the mainstream media is saying, and can you really trust those Alex jones types? Joe Average is starting to wonder if he really wants to bury several thousand dollars of guns. After all, they're fetching top dollar in private sales. Consequently many Joe Averages divest themselves of any skin they had in the game. In any case, they still have their deer rifle and their .45, and that's enough to fight tyranny, right? The hour draws nigh. The amnesty is drawing to a close. Finally, federal tyranny will have to bare it's teeth and be put down like the monster it is. The protests fire back up. Cold, dead hands, etc etc! The amnesty is extended for another three months. The cycle begins anew. By the second extension of the amnesty the assault rifle owners have become quite drawn and haggard. Nobody is kicking in their doors and they're getting tired of perpetually attending protests or talking tough on the internet. By the time the final extension peters out the protests are lackluster. True enough, there are still a LOT of assault rifles in circulation. The majority of them in fact. Many have since been buried. Many sit by bedsides or other handy locations, awaiting the inevitable jack boot of tyranny to come stomping. Their owners grimly await a valiant death in defense of liberty. Protests continue, albeit on a smaller scale. People photographed at such gatherings with illegal weapons start to lose their jobs or their contracts. "Can't be seen to associate with people flaunting the law, you understand." No crackdowns required. Meanwhile trade in the guns and their parts is closed save for the black market. What breaks or wears down has to be replaced by hand or not at all. Internet forum moderators studiously ban all talk of such things. They can be shut down easily if they were seen to be aiding and abetting lawlessness. Videos on Youtube and other video hosting websites that contain footage of the weapons in anything other than a blatantly historical context are removed, "just to be on the safe side". Only a few brave bloggers are left to post such content as they are able, and they will later be rounded up by their internet service providers as would be someone caught posting risque pictures of children. No top-down federal tyranny required. The SWAT teams continue playing cards to pass the time. By this stage the various cases have wound their way through the Supreme Court. If the ban is overturned then a few words in the legislation will be tweaked and it will be passed again. The slowing of momentum would require sophisticated equipment to detect. In any case, no company is going to bet the farm on retooling to ramp up supply of guns that might be illegal in another six months. As time ticks by we will see an all too familiar story recurring across the nation. An anonymous call from a concerned neighbor will have the police knocking on Joe Average's door at 3 in the morning. "Domestic dispute", they'll say, "you have to let us in". "I live alone", he might reply. "We have to verify that", they will counter. The rest is inevitable. Either Joe has hidden his gun(s) exceptionally well at short notice or he's going to find himself dead to rights. Maybe he's buried his guns in preparation for the day when he get's the memo from the ghost of Guy Fawkes instructing him to dig them up and RSVP for the revolution scheduled for Tuesday-week. Those guns thus buried will be fodder for future archaeologists. Most likely, Joe will long have come to hate that gun. It will burn in his presence like the beating of Edgar Allen Poe's Tell-tale Heart. Chances are he'll toss it in the river or sell it to some shady character down at the bar, if not by his own determination then by the insistence of his wife. "Anonymous tip leads to discovery of illegal weapon cache" will be the mainstream media cliche for a decade. The inference will be that the person in question is either a terrorist or a gang member. Their life will be turned upsidown. If they plead guilty then they get to go home and live out their lives as a convicted felon with a suspended sentence. The few that try to fight the charges will end up in federal prison as an example to the rest. Their fate will be lamented by internet patriots for five minutes per occurrence, during which many will tout the fact that they'll never give up their deer rifles, such being the necessary tool to defeat Federal tyranny. Others will shrug their shoulders. 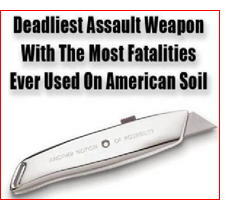 By the 20 year mark a new generation will come of age wondering how it was ever possible for people to legally own such deadly and dangerous weapons. The odd AR or AK will turn up in grand-dad's wardrobe after he shuffles off this mortal coil and the lawful ownership of such weapons in the USA will end not with a bang but with a whimper. Nobody has a crystal ball but you can reliably bet that while you have clean(ish) water, electricity, beer and television that the second amendment will only be diluted further. Ask the typical infantry grunt back from Fallujah how much of his kit he'd be allowed to legally own off-base without special federal permission slips. Americans, as with all people of formerly free Western democracies ought to prepare for the possibility that their back will never be put against the wall en masse. That there will be no great peril that makes brothers in arms of those who were formally mere neighbours and acquaintances. That no definable moment will tip the scales or "cross the line". Edmund Burke said "When bad men combine, the good must associate; else they will fall one by one, an unpitied sacrifice in a contemptible struggle." Every militia, every army and every nation can trace its history back to a single point in time when two men looked each other in the eye and agreed not to fall "one by one". Then two became four, four became eight, and so forth. Start associating. Because by the time you're waiting for them at your doorstep it's already too late. Gradualism is like that: insidious, powerful, and very hard to turn against the forces of tyranny. [[[ Here is what will really happen. Congress passes the law, the NRA et. al. scream about it and then … nothing happens. And my solution suggestion follows. Eh... isn't this the scenario we were essentially led to expect back in '93, when "assault weapons" were, in fact, banned? If memory serves, that ban is what ended with a whimper. In truth, no new ban will ever be needed because real, insidious gradualism is far more subtle and more pervasive. On that score, to better understand the endgame Obama is running, one needs to recognize two things: first, that the victors write the history books (even here in America) and, second, that the surrender of American sovereignty began on April 6, 1861 (long before the '30s). Ever since the federal government unilaterally granted itself the authority to make war on American citizens, to seize their property, to dissolve their democratically-elected governments, to usurp control over their currency, to jail them for political activities, and to determine the limits of its own authority (thereby ignoring the implicit limits placed upon it by the Constitution), democracy and the Republic have been nothing more than fantasies trotted out with florid prose whenever "patriotism" is required to promote another round of federal overreach. That surrender is what inverted the republic, leaving behind an empire ruled by a neo-mercantilist oligarchy in D.C., with control of the States and their formerly-sovereign citizens maintained ever since through the lingering threat of military force. That surrender ultimately destroyed State sovereignty and handed the federal government the power to impose whatever agenda might be desired by those who managed to gain control of it. The quasi-socialist program instigated at the federal level in the '30s could just as easily have been any other. The problem is not "leftists"; the problem is that there is a lever (i.e., a virtually omnipotent federal government) that can be used to impose an agenda that controls the lives of 300M+ people. The "leftists" just happened to be the ones to get control of that lever; it's been there since July 28, 1868, just waiting to be abused. A frequent correspondent sent this to me since I commented here, asking only that I not use his name.
]]]]]]]]]]]]]]]] A few thoughts, based on my experience in the contract engineering field. One client a few years ago sent people from HR out to the parking lot and noted all license plates with pro-gun stickers on their cars. Those in the union were told by their stewards that they had to get rid of the gun stuff, or else be first up in a pending layoff. Office directs were told that this would be discussed in the annual reviews, with negative connotations. Contractors (I was one, but I had no signs of gun ownership on the car or at work) were told that their contracts would be terminated at the end of the 90 day cycle, and would not be eligible for unemployment. This, or similar, is getting very common. Other places rigorously enforce no access to online pro firearms sites. Many of these also barred access to libertarian, Christian, or Paleocon sites as well. The Religion of Peace, well anything goes. When I was laid off in August, one reason was that I was very pro gun, and also, I attended a Pentecostal church that the client firm disliked. There were other reasons, mainly lack of work at my level, and I was glad to be laid off. I went looking at the national level after 2 months, when my wife and I sensed that my writing was not going to generate any income in the next 90 days. I went to a very good site for contractors; one that has been very helpful in the past, and was again. Several of the agencies and clients that contacted me asked early on if I owned firearms. When I answered in the affirmative, most of these recruiters ended the calls. The entire Left is waging the Long Game and doing it very well against the tepid, ineffective and short-sighted token resistance from the Republicans. Nitwits like Trey Gowdy and Darrell Issa have already denounced Obama's gun mandates today by proudly, smugly pointing out (accurately, to be sure) that his orders would have done nothing to prevent the San Bernadino murders or Charleston's or Newtown's. All true, but utterly irrelevant. Obama does not care about that. All he is trying to do is tighten the screws when and where he can, carefully calibrated to push barely less than the Republicans will find it worth fighting him. Obama's ultimate objective is disqualify everyone in America from qualifying to possess a firearms, all through regulatory mazes and additions, all the while merely claiming that he is simply "clarifying" or "defining" existing law and regulation. It will take time, but he has all the time in the world because, as I said fours years ago, the Totalist Party is never going to relinquish the White House again, and Obama will be quite content to see Hillary complete the job. My hobby is working at a gun range and yes, there are old timers that pass and the family does not know what to do with their stash of guns, ammunition, reloading supplies and gunpowder. I was the recipient of 8lbs. of Unique and 500 rounds of 45ACP hand loads. I smiled all day long on that one. We were asked by the donors to "recycle" the powder and ammunition. We did such simply by loading it and shooting it up. The local gypsies collect the lead and pay the range for it. I said a prayer of thanks to the man that passed for the ammunition and supplies I was able to use. Now that I am past 50 I continue passing on my love of guns, freedom and hunting to my son, with full explanation of what the intent of the 2nd Amendment is all about. I don't want to be that dead guy leaving a family with a pile of arms and ammunition that they don't know what to do with. I think that until people QUICKLY get very uncomfortable with the political environment, then yes, they turn into the proverbial boiled frog, doing nothing as they slowly are overcome. Regardless, as of today, if someone kicks in my front door they will quickly be met by my me and a Glock 17. Patriots owe no loyalty to an illegal govt. A govt that refuses to represent you. A govt that imports criminals. A govt out of control is a domestic enemy. This govt won't change simply because a certain number of passive citizens UNDERSTAND what is going on. Scott M is right, partly. The rest of the story is, "of the people, by the people, for the people", and when those jackboots are at your door they are not FOR the people. The jackboots are FOR the law, and the law has no standing. See, it's your NATURAL right to own what you will. You now live in a criminal environment. The sooner you realize this the sooner things start making sense to you. The downside is that because the law, and it's thugs, does not recognize your NATURAL RIGHTS it is your responsibility to defend them. Shooting a thug in the face as he tries to violate your inviolate natural rights is not murder. Your killing of the thug(s) is a defensive move and murder is not defensive, it is offensive. The thugs are attempting to murder you. Again, YOU must prevent them from murdering you. THAT is what it has come down to, here in Murderville. Remember: we have a criminal government because AMERICANS KEEP (RE-)ELECTING ONE. Each time Americans engage in this suicidal behavior, many (most?) of them believe they're supporting change for the better. Yet somehow, with each session of Congress, things get worse. Why? Are Americans idiots? Or is there something else going on here. Even (most of) those who no longer take part in this scam don't really seem to understand how and why the game came to be so hopelessly rigged. They blame "leftists" and "corrupt politicians". But the problem is NOT "leftists". It's not even "corrupt politicians". They are symptoms - artifacts of a broken system. The real problem is the fact that leftists' and corrupt politicians' jobs are made so easy: there's only ONE lever (instead of 50) required to impose their agenda, virtually handing them de facto rule over 300M+ citizens. Sensing notes that "the Totalist Party is never going to relinquish the White House again". Absolutely true. This is also the clue to the only fix that will result in a positive change: you find a way to make the White House LESS DOMINANT, i.e., to strip its reach back to that specified in the Constitution. But to do that - to understand why the system is so completely dysfunctional and find a way to correct it - you have to understand how it was broken in the first place. You have to understand how the Free Market of Ideas - as embodied by the several competing sovereign States whose authority was balanced against that of the general government - was shut down to make way for a centralized, mercantilist oligarchy over 150 years ago. You have to understand how the sovereignty of those States was neutralized, despite the fact that their consent and that of their citizens was (is!) REQUIRED to grant limited authority to a federal government. Finally, you have to understand how the resulting power structure has preserved itself by leveraging Human Nature, i.e., working to infantilize the conscripted "national citizenry" through propaganda, indoctrination, divide-and-conquer and welfare statism. But Americans, despite the readily available history left by every civilized human society that has preceded them, refuse to examine their own assumptions. Instead, they take those assumptions - and the broken system that is maintained by those assumptions - and try to use them to "fix" the problem, i.e., by putting the "right" people in charge of the broken system. Scott M is correct, IMHO: a broken system can't be fixed by simply knowing that it's broken. It also seems clear that a broken system can't function correctly no matter who is running it. Rather, one has to understand the how and the why of the broken behavior. This requires digging beneath one's blindly-held assumptions to find root causes, even if those causes are repugnant in the context of one's social programming. In the case of the broken U.S., the root cause is nationalism, as imposed in the 1860s and reinforced ever since by a lawless federal government. That root cause drives the insane premise that several hundred individuals in an isolated bubble thousands of miles away from most of the populace can rule a nation that is as large and as geographically, culturally, economically and morally diverse as the U.S.
TL;DR - finding the "right" presidential candidate won't fix a completely broken federal government. It's the federal government that must be fixed; and that will require getting the States off of their asses to pass an Amendment that THEY have the authority to enforce, rather than continuing to allow the federal government to usurp and maintain authority over the limits of its own authority. "....getting the States off of their asses...."
Q: Who are the states? "....limits of its own authority." Your 8 yo son likes candy, and you have a big ol' box of it sitting in his room, but he is only allowed to eat some after he asks permission to do so. He has discovered that he can eat as much as he wants anytime he wants as long as he asks for permission every now and then. If he doesn't ask for permission now and then you will get suspicious and cut him off. The problem isn't you or your son but the candy. The problem isn't the politicians or the citizens, it is the idea of gov't itself. Now, after lifetimes of programming, most people are terrified of the notion of no gov't. Their limited brains go into overdrive and conjure up all kinds of boogeymen out of thin air. Anarchy (the proper definition of which is: the absence of gov't) is the way most people live their lives every single day. THAT is the natural order of things and hardly anyone can recognize it any more and those that can are mostly terrified of being full fledged human beings. This is a crucial thing to understand, and it's at the root of why most limited-government "libertarians" have no choice but to accept the very premises every commie on the planet uses, and ultimately, when pushed to it, will soon enough start arguing just like a commie. A good way to think about how the non-human homo sapiens response to fear and greed is that they seek to hoard profits and spread losses. The chief motivation is laziness and chief tool to satisfy all is dishonesty. The interesting thing about dishonesty -- self, other directed, and institutionalized -- is that the better one is at it (the more dishonest) the less detectable and more powerful it is. What's interesting about laziness is how hard people work at not producing tradeable values. Consider a bum on the exit ramp day in, day out. I've seen some of them work their asses off at begging in the hot, cold, and rainy for years on end. How much easier it would be to work at a job? To look at it in its plainest form, there are those advocating that some fears are just too great not to force others to pay for general anesthesia, and the argument turns on which anesthesia and in what dosage is most "efficient" and "useful." Hey, maybe we can "privatize" the production and delivery of it, which still doesn't address the root laziness, dishonesty, individual responsibility or accountability. ghostsniper: disagree on almost all counts. There's only one way to maintain the world view you describe in your conclusion: you choose to dissociate yourself from the rest of society. That's not society, by definition. This is not to say yours isn't a valid choice. But it is a choice. If you believe in constitutional rights, you are the problem. Forgive me for breaking in with this (only slightly) off-topic link, but this essay deserves the widest possible circulation; it's a cracker! Cup of coffee and a comfy seat, in p & q required. It sums up recent history and extrapolates faultlessly (imho). Enjoy! Who's going to come and take them? Then again, recognizing his own rapidly approaching mortal end, "Joe" envisioned a somewhat different scenario. Observing the methods & effects of raids elsewhere, "Joe" prepares his dwelling for the seemingly inevitable, and then calls the JBTs in on his own location. As a concerned citizen of the regime of course. "Joe" was very intentional. Methodical. Thorough. But "Joe" was not home that night. but anyone who can pick up a frying pan owns death. "I don’t believe that service members would go back into the communities that raised them and conduct raids on good Americans in violation of the constitution." That's why those in charge would NOT send soldiers into their own communities, they'd send them into other communities, at least several states away where *emotions* are not an issue. I don't trust anybody or anything gov't related.